SoWhat?! Music Festival Just Got Real with Their Latest Announcement! Who else wishes it was 2016 already?! Let’s be honest, we all knew this was going to be real the moment Mike Ziemer announced Underoath is headlining 2016’s So What?! 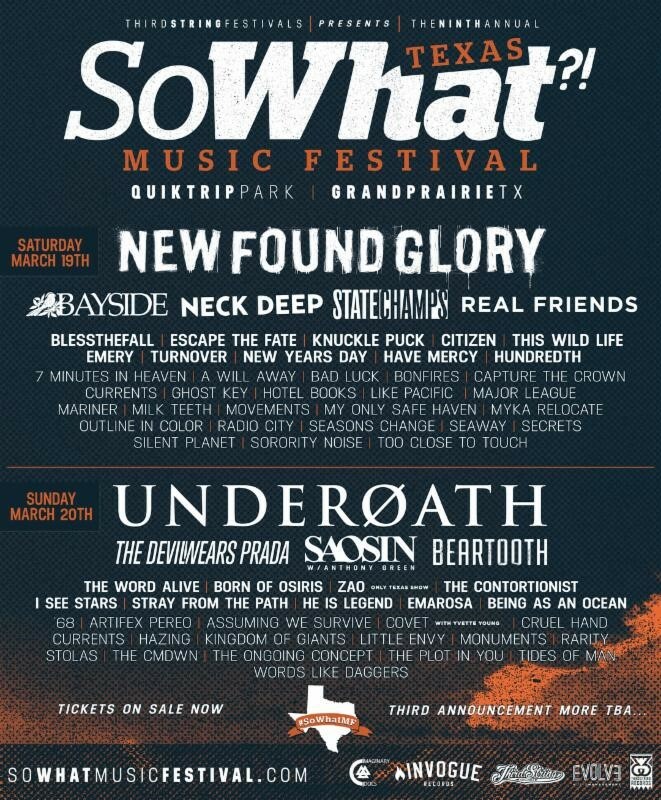 Music Festival (#SoWhatMF) alongside The Devil Wears Prada and Beartooth. And if you didn’t know it then, you certainly knew something was going down when they announced New Found Glory, Bayside and Saosin! I feel like the SoWhat?! Festival is the infomercial of Music Festivals because: “Wait! there’s more!” Two hours ago they announced Neck Deep,STATE CHAMPS, Real Friends, Blessthefall, Escape The Fate, Born of Osiris, Knuckle Puck, Citizen, The Contortionist, This Wild Life, I See Stars, New Years Day, Have Mercy, HUNDREDTH, He Is Legend, Emarosa, Seaway & more! The crazy thing is that they’re not even close to finished announcing all the bands that are going to be playing at this gem! I’m pretty sure with the third announcement they gave a good amount of their fans heart attacks, I can’t imagine what the next one will do. In my opinion, the festival gets better and better every year and they’re still just getting started. Now all Mike and his team need to do is pray to the gods that they don’t have torrential rainfall all weekend long again. Though giving them some credit, they did a great job last year of protecting their stages and providing the bands sufficient coverage to make the show go on. Quick tip: MAKE SURE YOU BRING A PONCHO, JUST IN CASE! That’s all, I’m cancelling the rest of my plans today because all I’m going to be thinking about is who is going to be listed on the next announcement! Would it be too hopeful to think they’re going to get Bring Me The Horizon this year? What do you think? “Grand Prairie, TX | December 1, 2015 – The 9th annual So What?! Music Festival (formerly South By So What?!) will take place on March 19th and 20th at Quiktrip Park in Grand Prairie, TX. The festival has already announced a slew of heavy hitters including Underoath, New Found Glory, Bayside, and more. Today the festival is thrilled to unveil their next round of artists including State Champs, Neck Deep, Real Friends, Blessthefall, and some of this year’s emerging acts. For a full list of confirmed and announced artists to date, head over to www.sowhatmusicfesitval.com now! Different from other music festivals, So What?! is a “festival made by fans for fans,” stated founder and promoter Mike Ziemer. Opening its doors in 2008, Ziemer and his company Third String Festivals had a vision to create an alternative music festival where fans could get away from the massively growing South by Southwest. The festival was designed for a more intimate ambiance for fans at a reasonable price. Located just a few hours shy of Austin, So What?! Music Festival delivers an array of musical acts including rock, metal, folk, dance, pop, pop-punk, and this year an all new acoustic stage (artists yet to be announced). Previous artists include Asking Alexandria, The Early November, Motion City Soundtrack, G-Eazy, Pierce The Veil, Cartel, Sleeping With Sirens, A Day To Remember, Taking Back Sunday, and more. As one of the fastest growing festivals in the state of Texas, there is no stopping So What?! Music Festival. 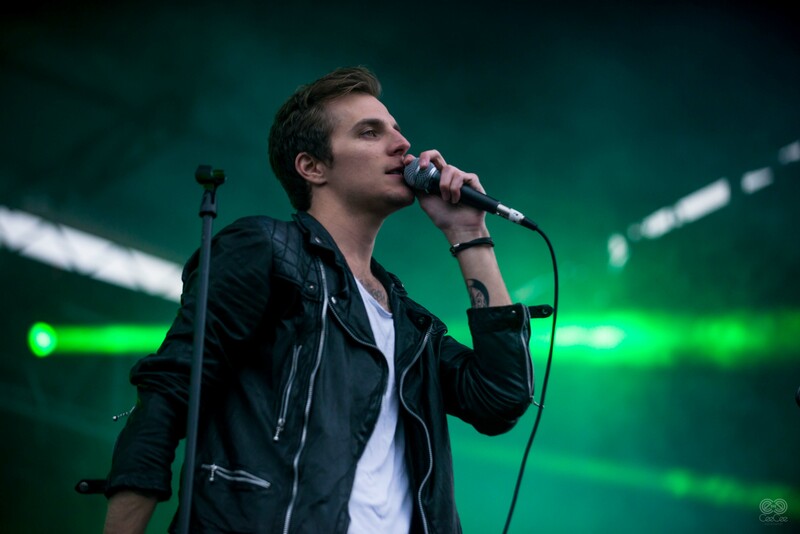 Multiple announcements with all new artists will be revealed soon, stay tuned!